Invasion redirects here. For the Spartan Ops episode, see Invasion (Spartan Ops). For the CTF gametype, see Invasion CTF. A group of players in Invasion in the Halo: Reach Multiplayer Beta. Invasion is a gametype in Halo: Reach. An alternate mode of the gametype is a variant called Invasion Slayer, which is a 6 vs 6, Spartan-vs-Elites slayer variant. Invasion is a team-based gametype and can be described as a large vehicular-based firefight. The default Invasion gametype is broken into three phases; successfully completing an objective in one phase will unlock the next phase. If the Spartans can hold out during any one phase, the game is over and they score a victory. As a result, UNSC Longswords will fly overhead and clear the zone with a tactical strike, rendering any and all data stored on the core completely destroyed. Should the Elites be in control of the current objective, the game will go into Sudden Death mode where respawning is disabled. The game begins on Phase 1, where only one portion of the map and no vehicles are available. As the game continues, more Phases unlock meaning there will be more objectives to be completed, vehicles will become available, and more Loadouts will become available as well. When carrying the data core, the carrier's movement will be hindered by the package, similar to that when carrying support weapons in Halo 3, and will be left defenseless and vulnerable to the Spartans. Invasion Slayer is a 6 vs 6, Spartans-vs-Elites slayer variant where players will eliminate the opposing team in order to score points; obtaining a total of 100 kills will end the game. Similar to the default Invasion gametype, the slayer gametype will be regulated through Phases which can be unlocked by either acquiring a specific amount of kills or surpassing a specific time. Players will not be able to choose which multiplayer model/teams they want to play in Matchmaking; the system will automatically assign the player to play as either a SPARTAN or an Elite. Standard Invasion mode is the default Invasion feature. Currently, the feature is playable on three maps; Boneyard, Breakpoint, and Spire. Boneyard's version of Invasion features the Elites on the offensive, trying to obtain a UNSC data core with valuable information on it, while the Spartans are tasked with defending it. In Breakpoint's version of Invasion, the Spartans are required to prevent the Elites from extracting a data core from an ONI science facility. In Spire's version the roles are reversed: Spartans must recover a data core being held by the Elites at the top of the spire. Phase 1 requires the Attacking Team to occupy the marked territories positioned inside the defending team's holding grounds. The process of occupying the marked territories requires 20 seconds. Successfully doing so will allow the attackers to proceed to Phase 2 and the match will be extended for several minutes. The Defending Team will win if the attackers fail to occupy the marked territories in less than four minutes allotted in Phase 1. Phase 1 is the first phase of the Invasion Slayer gametype and ends once the scoring reaches 25 kills or the timing reaches four minutes. The next phase will be unlocked if any of these markers are surpassed. Phase 2 requires the attackers to control one of the two newly marked territories in specific locations of the map; in Boneyard, the marked territories are located inside the refinery and beside the Spartans' vehicle bay; in Breakpoint, they are located on each sides of the syphoning structure; in Spire they are located beside the gravity lifts at the base of the spire. During this Elites attackers gain a Ghost and a Wraith for their use, and the Spartans get a Warthog and a Rocket Hog. To proceed to Phase 3, the attackers would need to occupy the marked territories for a total amount of 30 seconds (Boneyard and Spire) or arm the bomb (Breakpoint). Successfully completing Phase 2 will leave the data core exposed for Phase 3 and add an additional four minutes to the match. Phase 2 is the next phase of the Invasion Slayer gametype and ends once the scoring reaches 50 kills or the time limit reaches eight minutes. The next phase will be unlocked if any of these markers are surpassed. In Phase 3, the attackers must retrieve the data core and deliver it back to the Phantom or Pelican hovering onto the scaffolding near the ridge. Elites will have four loadouts. Spartans will have four equally powerful choices. Elites will unlock a Banshee in this phase, and Spartans unlock a Scorpion Tank (Boneyard) or a Falcon (Breakpoint and Spire). The attackers win when they successfully deliver the data core to the Phantom, also ending the game. If the Elites fail to capture the data core after four minutes, the round ends with the Phantom being destroyed by Longswords. Phase 3 is the final phase of the Invasion Slayer gametype and ends once the scoring reaches 100 or the match's time limit runs out. Surpassing either of these markers will officially end the game. There are also several areas to capture, once captured reinforcements will be dropped to your base. The higher your score the better the reinforcement. Reversed Invasion is essentially an Invasion mode with reverse roles; Spartans will be on the offensive trying to capture a Covenant power module from a Spire defended by the Elites. Spire is the only known map to feature this invasion mode. Phase 1 requires the Spartans to capture one of the two shield generators located in order to advance to Phase 2. Similar to the standard Invasion mode, successfully shutting down one of the generators will disable the security systems that leads to Phase 2 and the match will be extended for several minutes. In this phase, the Elites have the advantage of the selection of two loadouts; an Evade ability with a Plasma Repeater and an Active Camouflage with a Needler, along with Plasma Pistols as secondary weapons. The Spartans are given their standard loadout: the Sprint ability along with an Assault Rifle and a Magnum. Phase 2 requires the Spartans to activate the Spire, again by securing one of two designated areas for twenty seconds. In this phase, the Spartans will be provided a Warthog to assist them in their objective. Power weapons begin to spawn on the map in this phase. The Spartans obtain a sniper rifle, a rocket launcher, and a shotgun. Elites obtain a Focus Rifle and a Plasma Launcher. Loadouts are broadened to include medium range weapons such as the DMR and Needle Rifle for Spartans and Elites, respectively. If the Spartans successfully activate the Spire, the match will proceed to Phase 3. In Phase 3, the Spartans are required to retrieve the power module from the top of the Spire and deliver it to a Pelican awaiting near the beachhead. In this final Phase, both factions unlock air support vehicles to assist them in their objectives; Elites have access to a Banshee, whereas Spartans have access to a Falcon. Control of the air is heavily contested and often decides the outcome of the match. Loadouts become extremely powerful, with the Energy Sword and the Grenade Launcher being prominent. Unlike in Invasion: Boneyard, and Spartans' Pelican flys away, instead of being destroyed. This stage can be extremely difficult for the Spartans because the opposition will always load with the Energy Sword. The Elites dominate close quarters fighting while Spartans usually control the air. A way to counter this is to mount a team assault at the energy core or throw lots of grenades to flush the Elites out. In Invasion Slayer the goal is to score more kills than the opposing team. 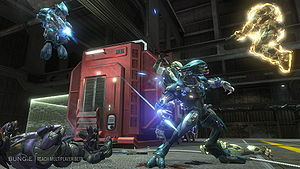 Like in regular Invasion, a team of Spartans is up against a team of Elites, and both teams have to capture certain spots that reward the teams with power weapons and vehicles to assist them in getting more kills. The power weapons and vehicles delivered depend on the phase the game is at. There are three phases in total. Invasion Skirmish is an Invasion Slayer variant with each objective either being all Spartans or all Elites. Variants also include Spartan Skirmish and Elite Skirmish. Loadouts in Skirmish differ from those in Invasion and Invasion Slayer. Even though the default setting for Invasion is 6v6, you can increase the maximum players up to 8v8 in custom games. The "Marksman" Loadout was removed from the first phase of this gametype during the multiplayer beta due to Spartan players able to take down Elites at long range, with the Elites having no loadout weapon with enough accuracy to effective return fire. In the Beta on Invasion: Boneyard, if the Elites don't capture the data core in time, Longswords will actually bomb the Elites with Fusion Coils. This can be seen in Theater as it only appears for a split second. After the Forgetacular Contest, a new map was chosen to be in Matchmaking, named Saurcered. There is a time frame at the end of each round where no objectives are available, but players can still score kills. Players who spawn during this period will be given loadouts from the other team. This is because players switch teams after each round. In the multiplayer beta, instead of the standard Red vs Blue team colors; Spartans were three different shades of green (a different shade for each fire team), while the Elites were shades of purple, reflecting the UNSC's standard olive drab, and the Covenant's signature purple. This color configuration is also present in the campaign of Halo Wars. Invasion is similar to Battlefield's Rush, Grand Operations and Airborne modes as well as Call of Duty: WWII's War mode. In the Halo: Reach Beta, SPARTAN command was voiced by Paul Eiding. ↑ Youtube: Halo: Reach Beta "Death Coil"